This body wash contains an energising blend of active organic aloe vera and refreshing lemon and lime. 100% natural fragrance, with essential oils. Free from parabens and SLS. Aqua (Water)***, Ammonium laureth sulfate*, Maris sal (Sea salt), Cocamidopropyl betaine*, Polysorbate 20*, Aloe barbadensis leaf juice**, Citrus limon peel oil / Citrus medica limonum (lemon) peel oil*, Citrus aurantifolia (lime) oil*, Melaleuca alternifolia (tea tree) leaf oil*, Potassium sorbate, Sodium benzoate, Citric acid*, Citral*, Limonene*, CI 75810 (Chlorophyllin-copper complex)*. ***Water from the lake district. 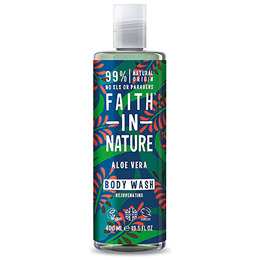 Below are reviews of Faith in Nature Aloe Vera Body Wash - 400ml by bodykind customers. If you have tried this product we'd love to hear what you think so please leave a review. A great body wash with a lovely scent and your skin needs very little body lotion after showering. Great natural gel. Been using it for a while now. Love the scent! Add another 5* to the list. Quite simply, the best shower gel I've ever used. Lovely fragrance and leaves my skin feeling fantastic. Have used this product for about a year, love it! This is definitely my favorite smell from Faith in Nature! Love that there's no nasties in there and it foams up well. Will buy again when on offer. I love this shower gel - my favourite of the range, hard to go back to non natural products now. Smells fab, obviously better when on offer as expensive at £5.45. Still would recommend. Love this shower/bath product. It feels very luxurious with a delicate perfume without the chemicals. Very good value and would definitely buy again, Highly recommend.